Three International Space Station residents departed the orbiting complex on Friday to start their return journey towards a rare nighttime landing of the Soyuz spacecraft on the steppe of Kazakhstan. 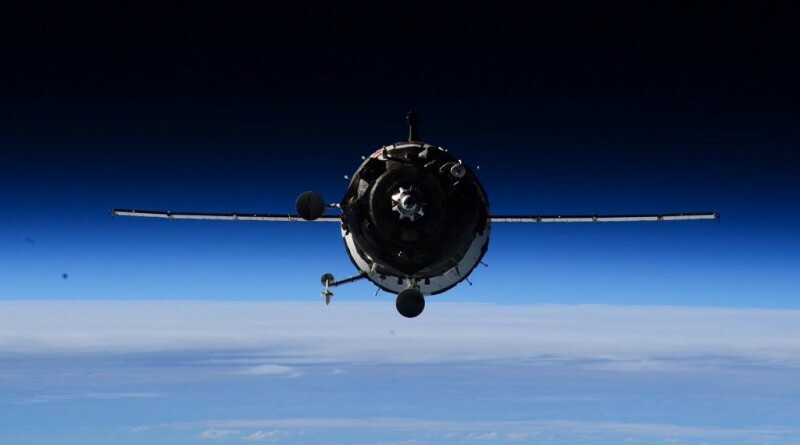 Veteran Soyuz commander Oleg Kononenko and his Flight Engineers Kimiya Yui and Kjell Lindgren undocked aboard their Soyuz TMA-17M spacecraft at 9:49 UTC, entering a two-and-a-half-four free flight to set up for a targeted deorbit burn and a blazing re-entry into the atmosphere. The Soyuz trio is set for a parachute-assisted landing at 13:12 UTC, around two hours after sunset at the landing site. 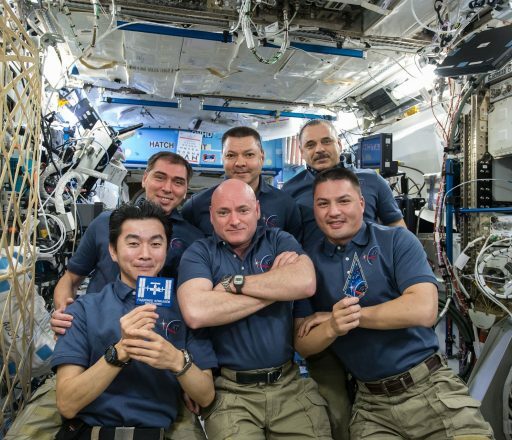 Wrapping up a flight of 142 days, the three returning crew members can look back at an eventful mission highlighted by a focus on over 200 scientific experiments supported by Kononenko, Yui and Lindgren. They also oversaw the arrival of the HTV-5 cargo craft, the return to flight of the Progress spacecraft after May’s Progress M-27M failure and, most recently, the capture of the Cygnus OA-4 spacecraft delivering a record-setting 3,500kg of cargo and resuming U.S. resupply missions to the orbiting outpost. 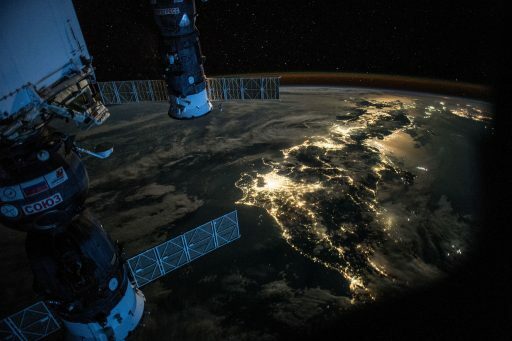 The crew can also look back at a direct handover between Expeditions in September and a pair of EVAs conducted in October with some additional excitement emerging in November when one of the Space Station’s power channels went offline. Although the recovery from the power system issue will be handed off to the next crew, the Soyuz TMA-17M crew members can look back at a very successful mission that had begun with a thundering blastoff back in July. With Expedition 45 winding down, the three crew members headed into preparations for their return to Earth. Return preparations were started around three weeks ago and included the usual testing operations of the Soyuz including checkouts of the vehicle’s thrusters, a number of landing procedure reviews by the crew and checks of the crew’s Launch and Entry Suits. Soyuz TMA-17M was loaded with return and disposal cargo comprised of hard drives and data cards containing data recorded by the various experiment payloads on the Station. Samples of ISS water systems, ambient air and microbial surface swabs were also stowed inside the Soyuz plus systems hardware set for laboratory analysis on Earth. The departing crew members tagged up with recovery forces for go over procedures in place for this rare nighttime landing of the Soyuz that arises from the orbital geometry that will not permit the Soyuz to fly to Kazakhstan during the day. The crew aboard ISS had a very early start on Friday in a timeline looking very different from previous Soyuz landings given the expected post-sunset arrival. Starting their day, the crew cleared out their sleeping quarters and packed up their final personal items that were placed into the Soyuz for return. Soyuz cargo loading was finished with a number of fresh blood and other science samples that return to the ground in double-cold bags. Oleg Kononenko powered up the Soyuz spacecraft and its various subsystems to begin the setup of the Flight Control System, also moving through communication checks with Russian ground stations. Also, quick release clamps were removed from the docking interface and air ducts were removed from the Soyuz spacecraft. 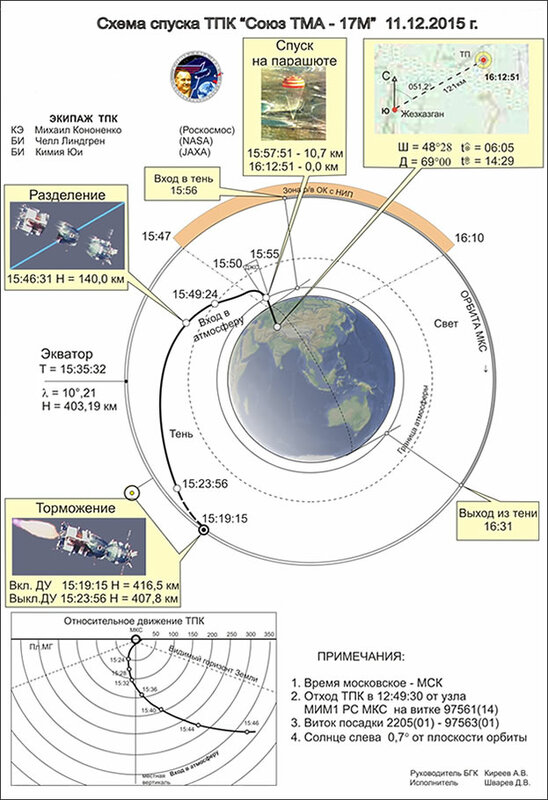 Mission Control Moscow provided the crew with a final update to their deorbit timeline based on the latest trajectory calculations computed using up to date tracking information of the ISS orbit. In Kazakhstan, a 300-person recovery team was mobilized on Thursday to pre-stage recovery forces in order to be ready to deploy to the landing site throughout the day on Friday. Off-road and all-terrain vehicles departed Dzhezkazgan on Friday and departed to the primary and ballistic landing sites. Helicopters were pre-staged from Karaganda and will become airborne when Soyuz makes its deorbit burn, committing the crew to their return. Soyuz TMA-17M aims for a touchdown in the southern landing zone, 121 Kilometers north east of the town of Dzhezkazgan. The recovery team includes members from all participating agencies – Roscosmos, NASA and JAXA, but the majority of the team is comprised of RSC Energia recovery forces that have plenty of experience locating Soyuz in all weather conditions, reaching the crew within the shortest period of time and handling the crew members and their vehicle after landing. 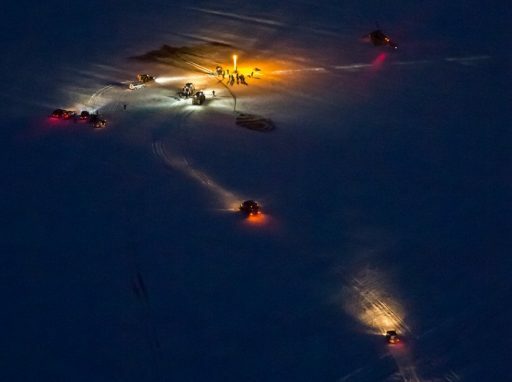 Even though this is a rare nighttime landing in winter conditions, the team should be able to rapidly locate the landed Soyuz using radio locator beacons. The recovery team includes 12 MI-8 helicopters and two fixed-wing aircraft that are circling over the landing area to act as command centers, also in charge of communicating with the Soyuz during the descent under the parachute. While recovery teams in Kazakhstan were getting ready for deployment, the crew in orbit enjoyed breakfast before the three departing crew members bid farewell and floated into their Soyuz spacecraft. Waving good bye, the crew closed and locked the hatch of the Soyuz spacecraft followed by the closure of the Rassvet hatch, completed by Mikhail Kornienko. Hatch closure was marked at 6:32 UTC, enabling the one-hour leak check to commence. While leak checks were in progress, the three crew members put on their Kentavr Anti-G garments and ingressed their Sokol Launch and Entry Suits. They then powered down Orbital Module systems and secured any loose items before taking their seats inside the small Entry Module. Oleg Kononenko, having logged over 500 days in space, prepared for his third landing aboard the Soyuz in the center seat of the Entry Module. He was flanked by Kimiya Yui to the left and Kjell Lindgren to the right, both getting ready for their first return from space. The crew closed and locked the Entry Module’s hatch, vented pressure from the Orbital Module and went through a period of pressure monitoring to ensure the hatch was tight. 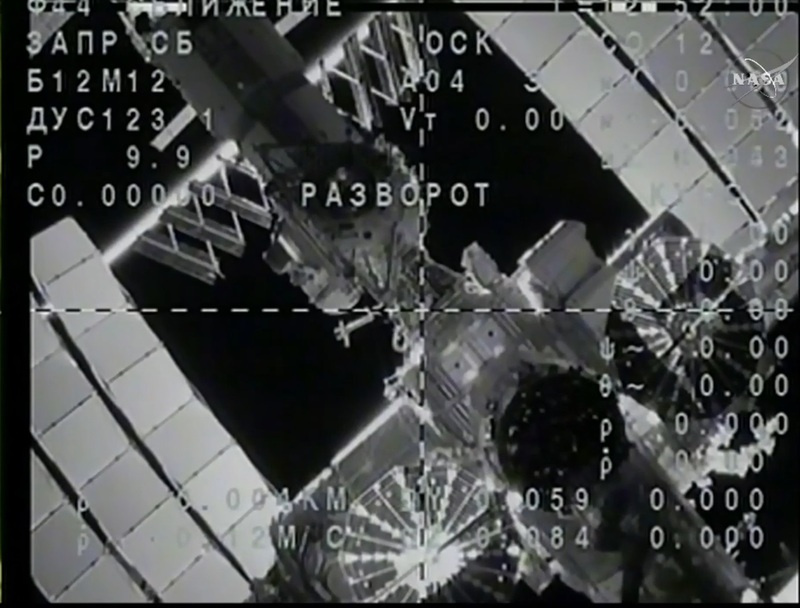 They also checked their suits for leaks and began setting up their spacecraft for undocking. Soyuz TMA-17M was switched to autonomous power and communications switched to the RF link between Soyuz and ISS – allowing the power and data interfaces within the docking system to the demated. Next was the opening of Rassvet’s hooks so that the Soyuz was only held in place by its own set of hooks. The docking mechanism was powered up five minutes prior to the undocking and the Space Station disabled the Russian thrusters to head into Free Drift after having performed a maneuver to point the Rassvet module to the velocity vector of ISS to simplify the departure of the Soyuz. 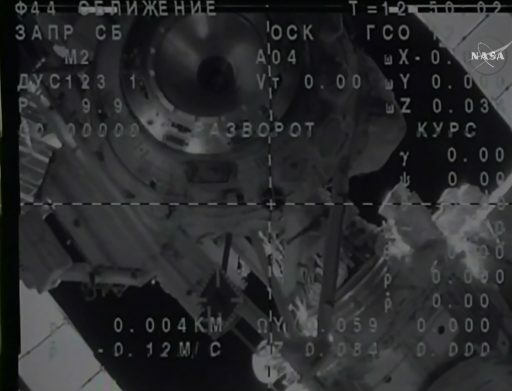 90 seconds prior to separation, the crew issued the Undocking Command that initiated the opening of the hooks on the Soyuz to break the hard mate between the spacecraft and the Rassvet Module. 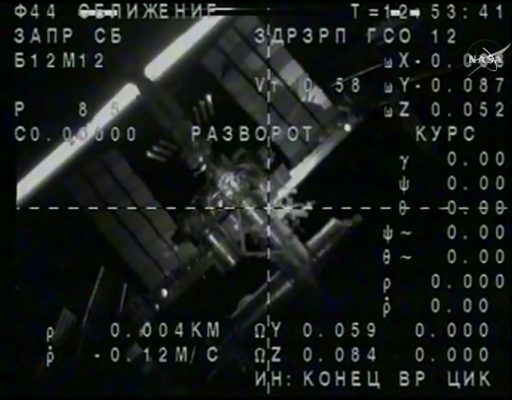 Kononenko reported that the indicator light for capture was no longer illuminated as was expected as the hard mate between the docking interfaces was broken. 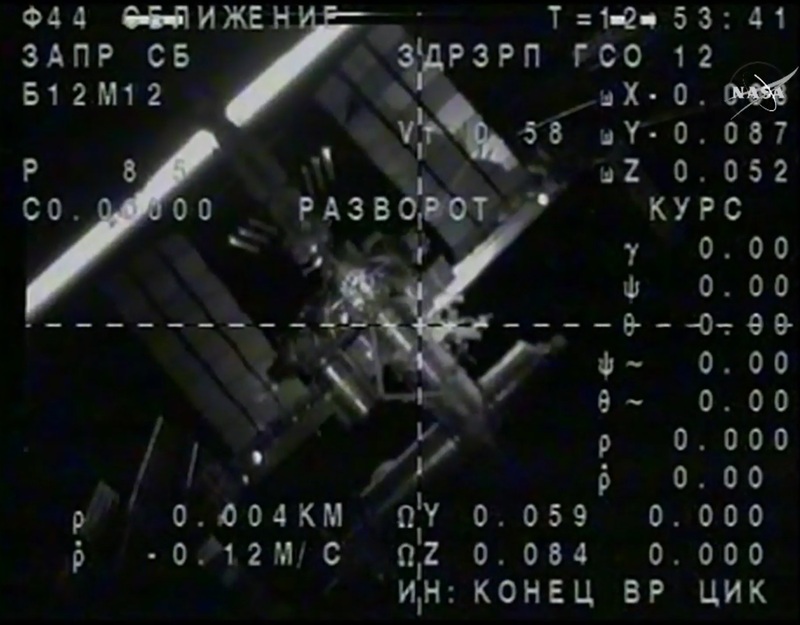 Physical Separation was confirmed at 9:49:35 UTC as loaded springs pushed Soyuz and ISS apart, allowing Soyuz to gently float away at a speed of just 0.12 meters per second. 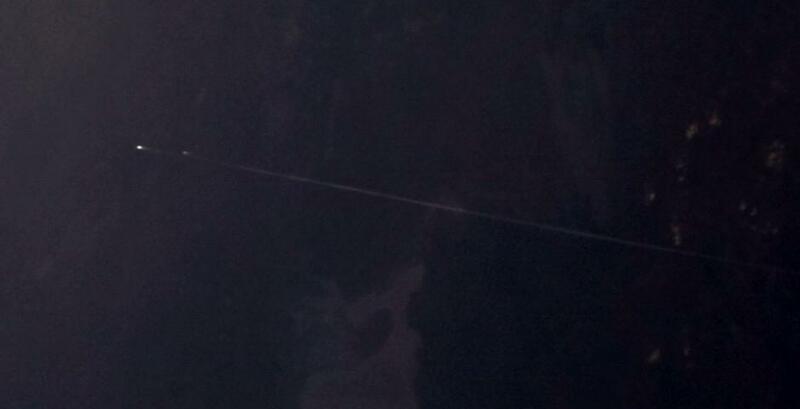 Separation came when ISS was flying high above Eastern Russia. With ISS in its nominal duty attitude, Soyuz floated away on the R-Bar, requiring the craft to make a two-burn departure to place the Soyuz on a nominal departure path along the velocity vector of ISS. After drifting away for three minutes, reaching a distance of 20 meters, Soyuz ignited its DPO thrusters for a burn of 8 seconds to increase its opening rate by 0.58 meters per second and depart ISS along the velocity vector, rapidly leaving the Station behind. With Soyuz entering a nominal departure path, on its way out of the ISS Approach Ellipsoid, the crew started a set of reconfigurations for their short free flight of one and a half orbits. Over the course of its free flight, Soyuz will retreat to a position 12 Kilometers from ISS for the deorbit burn. The setup for the deorbit burn will start around one hour ahead of ignition when the crew activates the accelerometer of the spacecraft, connects the Entry Module emergency batteries to the power bus, and activates cameras inside the Entry Module. Leading up to the burn, the crew will verify burn parameters via the outputs of the Digital Flight Control System of the spacecraft. The crew will then watch over the re-orientation of the Soyuz spacecraft to the retrograde burn attitude followed by the opening of the SKD main engine cover. Ignition of the SKD engine of the Soyuz is planned at precisely 12:19:18 UTC on a deorbit burn of 4 minutes and 40 seconds that will slow the Soyuz down by 128 meters per second to place it on a trajectory to intercept the atmosphere at a precisely calculated position. SKD consumes hypergolic propellants and delivers 300 Kilogram-force to slow the vehicle down while flying high over the Atlantic. The deorbit burn has to be performed with great accuracy to put the Soyuz on a path to intercept the dense atmosphere within a narrow corridor, en-route to the planned landing site south-central Kazakhstan. Inside the Entry Module, the crew will carefully monitor the performance of the SKD system during the burn, reading out burn parameters to Mission Control. Afterwards, they will close their helmets in preparation for the depressurization of the Orbital Module that occurs shortly after the Soyuz is committed to re-entry. The Orbital Module is depressurized to avoid an explosive release of air when the modules of the Soyuz are separated. Module Separation is expected to occur at 12:46:33 UTC when the Soyuz is 140 Kilometers in altitude, approaching the dense layers of the atmosphere. The three modules of the Soyuz are separated by firing a set of pyrotechnic devices within the interfaces of the modules to allow the Service and Orbital Modules to be pushed away by loaded springs. The relative velocities of the modules are set up so that no risk for re-contact exists at any point during the re-entry process. Immediately after separation, the Entry Module will begin using its Hydrogen Peroxide thrusters to maneuver to the appropriate orientation for re-entry – its heat shield facing the direction of travel with Soyuz flying at a re-entry angle of 1.35 degrees, set up by the deorbit burn. The Entry Module of the Soyuz is 2.24 by 2.17 meters in size weighing nearly three metric tons, equipped with Hydrogen Peroxide thrusters used for attitude control during re-entry. It is not the most spacious vehicle, but offers enough space for the three crew members and some cargo that is returned for post-flight operations. Soyuz will dip inside the dense atmosphere at 12:49:27 UTC when it will pass below 100 Kilometers and begin feeling the effects of the upper reaches of the atmosphere at a speed of 7.6 Kilometers per second. For the first 94 seconds of re-entry, the Soyuz will stick to its initial re-entry attitude before enabling Entry Guidance that will put the Soyuz through a series of bank maneuvers and modify its lift to home in on its planned landing site located 121 Kilometers north east of the town of Dzhezkazgan. Blazing through the atmosphere, Soyuz will slow down rapidly, pulling up to five Gs which can be quite strenuous for the crew after returning from extended exposure to microgravity. The Peak G Load occurs at an altitude of 33 Kilometers when Soyuz will still be traveling over two Kilometers per second. Parachute deployment is expected when Soyuz passes 10.5 Kilometers in altitude starting with the release of a pair of Pilot Chutes that will pull out the larger Drogue Chute from its parachute bag. Under the Drogue, the Soyuz will slow down to a speed of 80 meters per second to create safe conditions for the deployment of the main chute that will slow the Soyuz down to a speed of 6.5 meters per second, also transitioning to a vertical descent. Descending vertically, the Soyuz will go through a set of preparatory steps for touchdown – jettisoning the heat shield to begin taking data with the landing altimeter, separating the window covers, venting down the Hydrogen Peroxide tanks and equalizing the cabin pressure. Inside the spacecraft, the Kazbek seats will move up to be able to absorb some of the shock occurring at landing, also signaling the crew to get ready for the big finale of their return to Earth. Split seconds before touchdown, the Soyuz will fire its solid-fueled soft landing engines to cushion the impact. Touchdown is expected at 13:12 UTC on Friday in the southern landing zone of the Soyuz where a 300-person recovery team will be standing by in helicopters, all-terrain vehicles and off-road vehicles to begin rushing to the landed Soyuz craft. Because Soyuz will land in the dark at 19:39 local time, no video of the descending spacecraft can be expected and teams will rely on radio locator beacons to quickly find the spacecraft and rush towards the landed capsule. The three crew members will be helped out of the Soyuz to enjoy a breath of fresh air after their post-sunset landing, bringing plenty of memories from a long flight to Space. At the landing site, sub-zero °C temperatures are forecast for the expected time of landing as well as light snowfall and breezy winds up to 40km/h.